Preheat the oven to 450 degrees. Drizzle the olive oil into a 9" x 13" baking dish and use your hand to evenly coat the entire surface. Set aside. Combine the ground pork, salt, cherry peppers, pickling liquid, bread and eggs in a large mixing bowl and mix by hand until thoroughly incorporated. 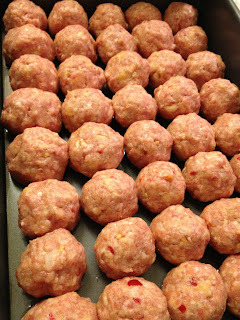 Roll the mixture into round, golf ball-size meatballs (about 1 1/2"), making sure to pack the meat firmly. Place the balls in the prepared baking dish, being careful to line them up snugly and in even rows vertically and horizontally to form a grid. The meatballs should be touching one another. Meatballs all lined up ready to roast! Roast for 20 mins, or until the meatballs are firm and cooked through. A meat thermometer inserted into the center of a meatball should read 165 degrees. Allow the meatballs to cool for 5 mins in the baking dish before serving. Top with tomato sauce, fresh basil, and grated parmesan cheese.